Arriving at our woodland after an absence of some time I was devastated to find that a whole section of it had been felled. I hadn't given permission and it’s not what I wanted at all. Hundred-year-old oaks and big ash trees had gone. Oh, and there were the stumps of those beautiful beech trees which I’d loved. To tell the truth I was quite emotional. I cried, and then I was angry. Then I was frustrated, knowing that whatever the explanation it wouldn’t bring back the trees. Even if I replanted them - which of course I would - the new trees wouldn’t reach maturity in my lifetime. 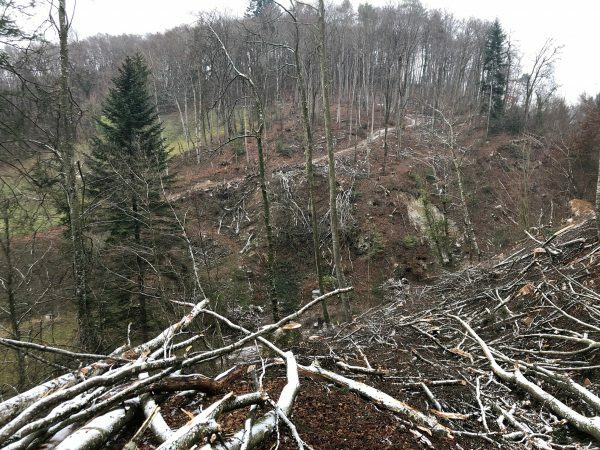 The explanation turned out to be as prosaic as it was disappointing - the authorities has decided that they needed to make the valley safe from the risk of trees falling into the stream. This might in turn result in a build-up of water and mud, which might then be released and be a risk to people and property. I didn’t accept the argument. Generally speaking, the roots of such trees hold the stream bank together and the trees were very unlikely to be blown over. Furthermore, many of the trees that had been cut down were well away from the stream. But it turned out that they did have authority to do some felling near the waterway that my neighbour had agreed; and the officials had mis-understood that he was agreeing on my behalf. I wasn’t interested in pursuing it legally and looking for compensation - money wouldn’t bring back the trees - however crass it was, they’d done what they thought was right - but “my trees” were gone. I was left with a hollow feeling. 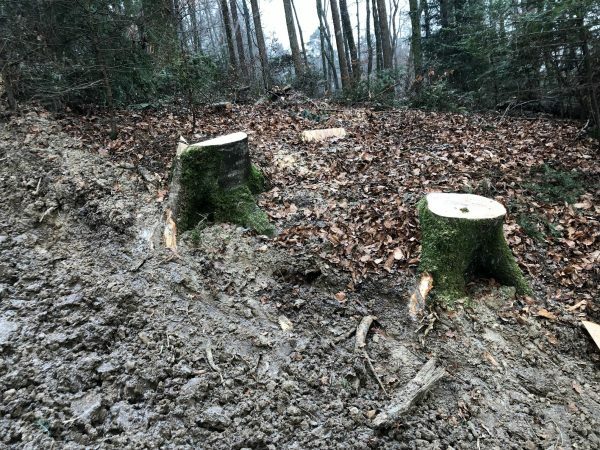 My frustration and anger reminded me of the emotional response to the proposed selling off of the English Forestry Commission estate a few years back. Also the emotive issues around the cutting of the Cherry Orchard in Checkov’s play of that name. We humans have an emotional attachment to trees which sometimes takes us by surprise, especially when the trees are under threat - or are felled. Even when the trees are lost through an “act of God” such as the 1987 storm in southern England - we realise how much trees mean to us. This might be the reason that disputes over trees can do so much damage to neighbour relations - the neighbour’s tree may be clearly on their own land but you live with it and it’s part of your world so if they decide, unilaterally, to cut it down you can get inexplicably angry and frustrated. 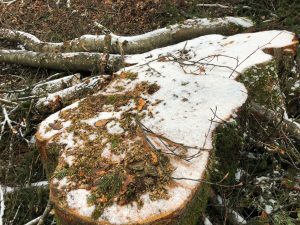 Efforts to protect trees through TPOs are understandable as are the consequences of breaking a TPO, but still if the tree disappears no amount of fining the culprit will bring back the tree. Only time heals these wounds. And replanting. I am so sorry to here this. I know your not interested in legal action but might you consider a complaint to the relevant ombudsman to make sure they take more care in future? I’m so sorry to read about this upsetting crime. Also, your observation that the perpetrators have set themselves up as so-called “authorities” adds insult to injury. I think this links with one of the underlying themes in destruction of the natural world: that it typically goes together with misuses of power by one human being over another. I don’t buy the excuse that the trees posed a risk, because if this were the reason, then, considering human health and safety, there are far riskier things to get rid of than trees. You probably already know this, but you are far from alone. Worldwide, it’s estimated that about two people every week are killed in the ongoing fight to protect the natural world from destruction, and many of these are in conflicts between illegal logging activities and the traditional owners of the land. In another sense, you are not alone, as well: that a crime like this is, in a sense, committed against us all, isn’t it? Yourself and your family, anyone living locally, who loved those trees, and then, more broadly, anyone who breathes the air. I’d have hoped that Woodlands.co.uk would have been able to do something to help you, and I did browse the website of Client Earth, although they don’t give legal advice online, they have contact details on their website, and hopefully might be able to have a conversation with you and maybe give some pointers? It does sound rather too easy for me to sit at a computer and urge you to take what action you can against these criminals, as you’re the one who is the main victim of the crime, and the most hurt by it. May I add my voice to the others here, all of whom are joined in outrage and in support of you, and wishing you well in whatever action you decide to take. Firstly, Angus let me say that I’m sorry that this happened. It is heart-rending to be sure. But something doesn’t ring true about this. What the authority is talking about is a slow long term process, unless there is a landslip, and as you so rightly point out living tree roots hold the soil in place. 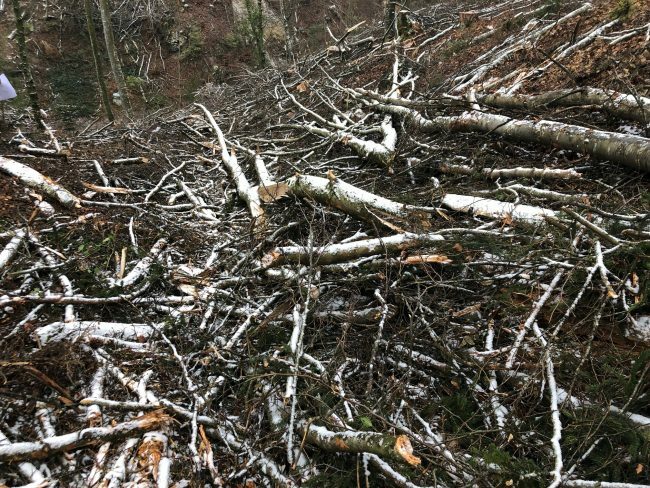 If it is your land and your trees, if they fall in the river, surely it is your responsibility to clear up the fallen trees? And surely it is the authorities role to police the river and ensure landowners are keeping the river clear of fallen trees. If the above is true, the authorities have over-stepped their authority, an overzealousness possibly for political ends? Compensation won’t bring the trees back, but it is a recompense which can allow you to repair the damage done. It is also a legal punishment to the authority – and it is an authority and NOT an individual that is responsible. If you let it pass unchallenged it can set a precedent. By taking action you are preventing this from happening to you or other woodlands landholders in future. It is a violation of your property and with the present high handed attitude of the Gov’t in general, you would be doing the people of the country a favour by seeking some sort of legal justice. It’s not about the river flooding – it’s about the process, how the authority goes about its business. Pardon my French but you need to grab them by the short and curlies and squeeze until they admit defeat – so that it never happens again. All commerce (modern life) is contractual. If your signature isn’t on any agreement pertaining to this then sort it in court. Get represented by a knowledgeable friend or someone prepared to help. Anyone from the Bar has by their oath to represent everyone else, from the Crown downwards, and you’re last on that list. Looks as though some of those trunks would have been to the value of c£1,000 each. Sue them. They should pay for their arrogance and imcompetence. Oh Angus! Thank you, for sharing your loss…. so painfully sad…. but everything you said came with resonance. One of the commenters stood out, ‘mechanical beavers’…. encouraging words, but shows that the beavers are true custodians and the ‘men with machine hearts and machine minds’ …. are in danger of losing their souls. This is a truly evil action. On top of the hurt and distress this has caused you it looks from these photos like somebody may have profited at your expense. This action looks like it may have been driven more by greed than by a misunderstanding. Where are all the large timbers from the felling? Looks like someone may have taken the timber away for their own ends! 100 yr old timber from beech, oak and ash trees will sell for a high price. Angus, you are a victim of crime here. Report it to the police, find out who was responsible and take them to court. Don’t let them away with it. A judge is very likely to rule in your favour. Although this won’t replace your trees it may give you the financial compensation you need to replant. I really do sympathise with you on this. Awful. And I’m rather impressed by the fact that your sadness and shock haven’t translated into rage and a thirst for revenge in court. However, perhaps you can take some comfort from my recent experience in Scotland, where I have been looking at what happens in woodland when there are beavers. Just like your experience, a lot of big trees are brought down and stripped of bark,leaves, twigs and small branches, along the riverside and up 20 or 30 metres away from the river. It’s quite a shock to see quite big trees brought down. But what impressed me was how quickly the woodland recovers… trees coppicing like crazy all over the place, regrowing, flourishing. And the sudden openness of the woodland where the beavers have been gives rise to a whole new zone of riparian varieties, plants, flowers, and consequently new insects and birds (I had a pretty expert guy guiding me around, showing me these things). So perhaps you could see your council workmen as ‘mechanical beavers’….. It might not be an unmitigated disaster. I am so sorry to hear this. I share your grief at the loss of your trees. It seems authoritarian to do it without informing you and carrying out a study to check that the apparent justification is based on science and not some incorrect but plausible version of “commonsense.” In general…deep rooting trees improve soil stability….these trees in fact! If you did change your mind and take them to court it could send a message that might save other trees…and require them to replant….and give you compensation…..but I fully understand you might not want to take on what could be another emotionally draining experience. The trees will be here long after we have gone……keep planting! and Good luck. I’m so sorry, what a terrible thing to happen and what a shock you must have had. I totally understand how cutting down these old, living, wonderful trees would be emotional. I would certainly have cried. As I read it actually made me think of the terrible emotion people suffer when their dog is stolen – that they couldn’t protect it and keep it safe. All that emotion aside, I’m appalled they COULD be cut down. Without proving, with extensive surveys, they posed a real threat. I feel if those surveys had been undertaken you would have been identified as the owner. Here in Sussex there is extensive house building underway, some of it on greenbelt, some of it in AONB. I tried hard to get a new access to one development (truly for very rational and real reasons – the street access already existed, it just needed modification). I was told a cherry tree prevented this from happening. I concur it is a magnificent cherry tree. However, the benefits would have far outweighed the sad loss. I proposed we could take a graft and create a roundabout with a new cherry tree, but no. The point of my story is that there is no logic or good sense. Awful. This would seem to be the exact opposite of the new policy of ‘Slowing the Flow’, using plantings and natural dams to prevent flooding rather than clear-cutting hillsides to facilitate flow. So sorry this happened to your woodland! Why and how should you prune your woodland trees?